1. Preheat oven to 400. In a large bowl, toss potato wedges with olive oil and season with salt and pepper. Spread on an even layer on a medium baking sheet and roast until tender and golden, 35 to 40 minutes. 2. Meanwhile, make dressing: In a medium bowl, whisk together mayo, ketchup, hot sauce, Worcestershire sauce, and onion powder. Season with salt and pepper. Refrigerate until ready to use. 3. 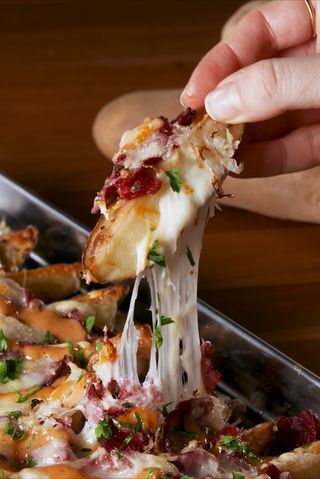 Top roasted potatoes with corned beef, sauerkraut, and Swiss cheese. Bake 10 to 12 minutes more, until cheese is melty and corned beef has crisped around the edges. Drizzle with Russian dressing and garnish with parsley before serving.